Texas tea. Not really but black and gold is not a bad conglomeration at all. I once again conglomerated around the necktie, as I often do. I figure if "They" put the colors together on a tie then it must work. 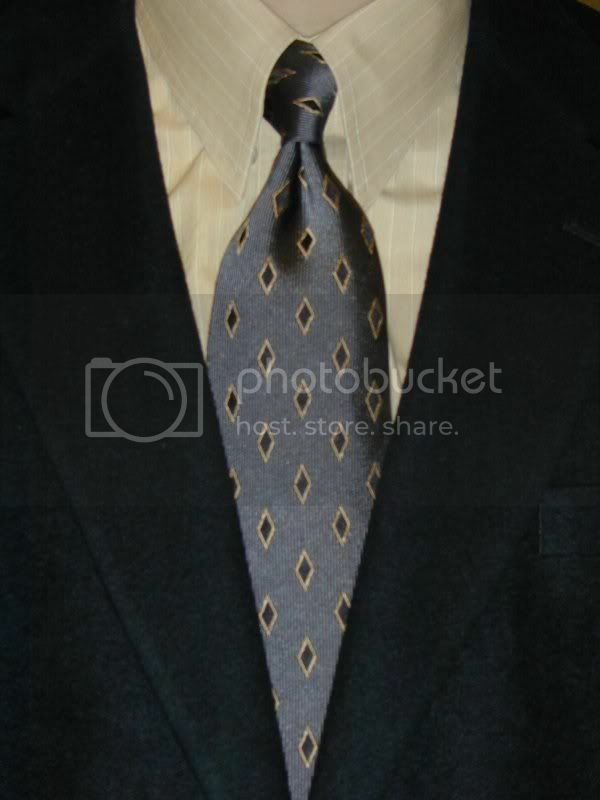 The necktie has a vertical pattern of black and charcoal stripes for a background. I'm not fond of vertical or horizontal stripes on a tie but on this particular one it's really more texture than pattern. Over the top of the background it has black diamonds outlined in gold. The dress shirt is a gold, broadcloth, hidden buttondown collar with lighter gold stripes. It really picks up the diamonds' gold outline on the necktie. The collar really does end up looking like a straight collar without any of the hassle of a straight collar. I really don't know why this style of collar didn't become more popular. Topping off the whole thing is the black sport coat. Why? Because the diamonds are black! If you're curious, I wore charcoal trousers. I'll give you three guesses why and the first two don't count.